Dram Bero is a Dunmer noble and a councilor of Great House Hlaalu. Highly paranoid and secretive, he can be found hidden behind a locked door in the lower levels of the Haunted Manor in the Plaza in St. Olms Canton in Vivec. He apparently distrusts fellow councilor Nevena Ules, seemingly preferring to ally himself with Crassius Curio. As such, he is seemingly one of the more progressive and least corrupt of the Hlaalu leaders. 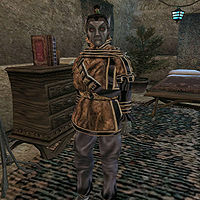 Bero holds a high standard for the House, shunning petty thuggery and murder, as reinforced in his book Grasping Fortune, an introduction to House Hlaalu. He wears an extravagant shirt with matching belt, pants, and shoes. Aside from his natural resistance to fire and the sanctuary provided by his ancestors, he knows no spells. Bero is an important character, involved in several quest lines, including the Main Quest, during which you will need to gain his approval in order to become Hortator of House Hlaalu. He is also important to members of House Hlaalu, who will need to locate him and defeat his champion, Garding the Bold, in order to gain his support on the Hlaalu council. Additionally, Bero is very interested in the location of the lost Vassir-Didanat Ebony Mine, the location of which—although technically outside of his jurisdiction—he will consider valuable knowledge. If you choose to reveal the location of the mine to him (instead of revealing it to either Nevana Ules or Velanda Omani), Dram will reward you with a daedric weapon. However, as he distrusts Nevana, he will not reward you if you have visited her since discovering the mine and prior to revealing the mine's location to him. "I take precautions to ensure that I am not found easily... I see I will have to take more precautions. But what can I do for you?" "So you've found me again? Easier than the first time, no? What are you here to discuss?" Vassir Didanat Mine: "The mine of Vassir-Didanat has been lost for many years. Would you, perhaps, know the location of this mine?" Nevermind: "Oh, you're looking for it too, eh? Well, if you do find it, I might give you a token of my gratitude. Not a payment, of course, but a gift." Tell the location of Vassir-Didanat. : "So. That is technically not in my jurisdiction, but I can still make use of his knowledge. I feel you deserve some compensation... What type of weapon do you use?" Bows. : "I like to keep a distance from my enemies as well. Please take this Daedric Longbow with my gratitude." "I am glad the mine has been rediscovered... But next time, speak with me first. I am sure I could have made you a better offer." "Hmm... So you told Nevena Ules about the mine. Has she paid you yet? No, I can tell by your expression that she has not. Next time speak with me. I am sure I could have made a better offer." This page was last modified on 19 February 2019, at 20:29.